If you are wondering what cable to use to wire up your 12V appliances then you need to know what amps it will be drawing. This can be worked out using the equation below. 1mm Cable : Suitable for low wattage appliances such as LED light circuits. 2mm Cable : Ideal for wiring up 12V sockets which can usually take up to 20Amps. 3mm Cable : Ideal for wiring a Waeco Compressor Fridge, depending on how long the cable run needs to be. 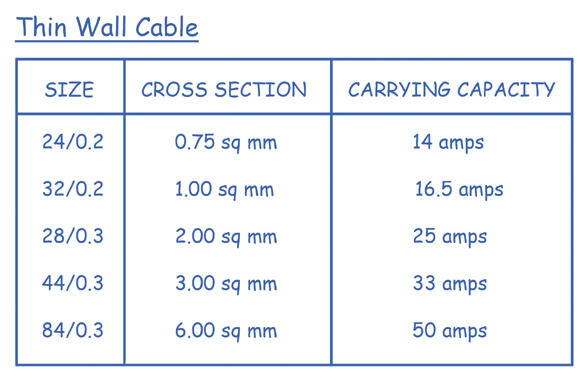 6mm Cable : Ideal for the heavier wattage items such as inverters. Please note: This is to be used a guide only, we take no responsibility for items being wired incorrectly.